In the last 60 days the floodgates of anti-Semitism have been unleashed. Violence, beatings, harassment and the call for the global genocide of the Jewish People have been sounded throughout Europe, even landing on our shores. Within the last three weeks a Rabbi in Miami was murdered, a Jewish mother in Brooklyn was savagely beaten, and young couple in NYC were attacked. Using the Israeli-Gaza War as an excuse for their attacks, anti-Semites have attacked Jewish communities. Many are culpable for the beginning of the new inferno of Jew-hatred, especially the media for distorting facts and kindling the bonfire for the calls for a new genocide. 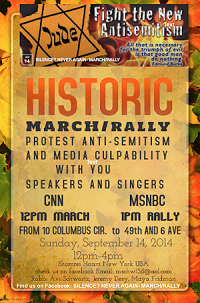 The march will commence at 12 noon at CNN, 10 Columbus Circle, ending with a rally at 49th and 6 Avenue next to MSNBC. With a lineup of dynamic speakers and singers the event will be historical, fun and herald a new day for Jewish survivability. The event will be from 12 noon to 4pm. Please let me know if you would be interested in covering the rally. We look forward to seeing you at Columbus Circle on September 14th!! !